Wow! I can't believe how the last 2 weeks have just flown by. I don't even know what I've been doing lately. Heck, I have such issues with short term memory loss that I can forget what movie I'm watching when the show goes to commercial. Kinda scary. I neglected to mention this at my appointment yesterday because, well, I FORGOT. It was a 2 hour drive to Jacksonville only to have blood drawn, pee in a cup, and have my vitals taken. Then a 2 hour return trip. I was told it was to be the shortest of all my visits. Next month I'll have the dreaded eye exam and the PFT along with the EDSS and EKG. And, in keeping with the theme of all that, I think I'll take some alphabet soup with me to have for lunch that day. Anyway, at the checkup I found out that I'd lost 2 pounds (Squeeeee!!!) right after she noticed the scale wasn't set right and cranked the knob back 2 lbs. (I'm claiming the weight loss regardless). I also found out that my HR was 72 and my BP was 104/68. I left there feeling pretty good about myself -- like I passed some kind of test with great marks even tho the scores were beyond my control. I found the logo quite cute as, at first, I thought the "O" had the man in the moon on it. Upon closer inspection I could see it was a person in profile and a hand tossing a pill into their open mouth. Novartis seems to be really banking on the attraction of this med being in pill form. I guess it's not too hard to imagine that a bunch of people sentenced to stick themselves with needles the rest of their lives might dream of one day taking a pill instead. 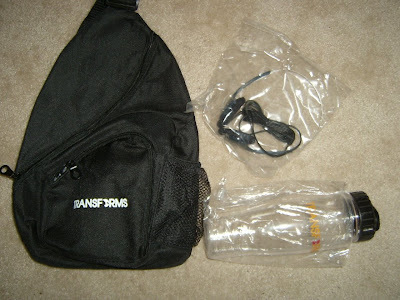 Anyway, inside the pack was a water bottle with the logo on it and a pair of headphones. The headphones were an enigma (better than being an enema I suppose) due to not having anything to listen to. I didn't want to question it, tho, because after all it was a gift. But, my smart-assedness got the better of me and I couldn't resist. "Oh nurse?" I yelled down the hall. "yes?" she looked back quizzically. "The iPod fell out of my bag you gave me." After having undergone a year of my smart-assedness, she knew right away I was joking. "Actually, they aren't giving away iPods with those bags." "I know, I was just joking." "They're giving DVD players, but they haven't arrived yet." Now it was my turn to wonder if she was joking. A quick scan of her facial expression coupled with my past experience of her use of humor told me that I was indeed going to be getting a DVD player. "Cool! You know I was only joking about the iPod. I never expected they'd give out DVD players!" "Yep. They should be coming any day now. We'll have one for you on your next appointment." So, what I at first thought was cool started to upset me. I mean, if they can go giving a couple thousand people DVD players for being guinea pigs, it can only mean one of two things. They are about to tell us we are all going to die from some heretofore unknown irreversible side effect, or they are going to charge out the nose for Fingolimod when it hits the market. Maybe they'll have to call the pill "Mykidscollegefund" or "InLeiuOfMortgageThisMonth" or something fancy like that. I did say that it would have been better to give these out on Randomization Day so that we'd have something to do during that 6 hr. observation stay. She said "actually, there is a trial that's still recruiting, so some participants ARE getting these for Randomization Day." She couldn't have given me any better news. By telling me they are still recruiting, she basically just told me that I'm going to be getting my meds for free for a while. I don't have to start paying until the trials are all over and the FDA approves it. By that time, maybe I can find someone to buy the DVD player so I can get a day's worth of meds. I better keep it New-In-Box. Yep, you better bet that they're going to charge something fairly close to current costs of DMDs. Or at least no more than a 50% discount. LOL, Suldog! And here I was only going to leave a smarta$$ remark about enemas!